« La temporada 2010 comienza! After a long absence, we are proud to announce that 2010 Season has already started. 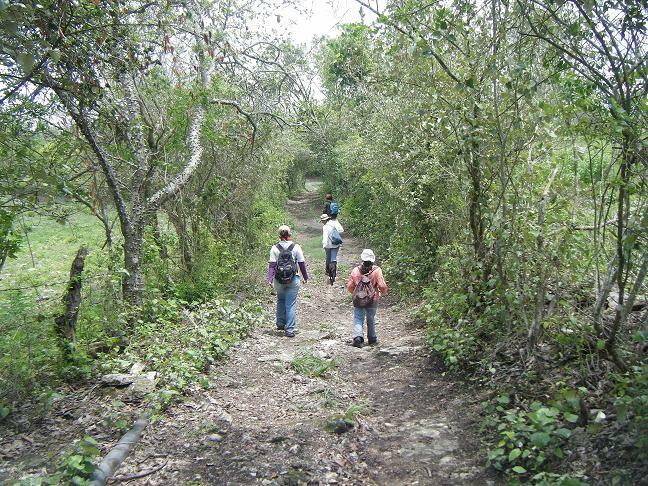 Permits obtained, funding received and team all set up, we’ve decided to go on with our surface survey, completing an area of 60 square kilometers (2009 plus 2010 seasons), which will allow us to generate a regional settlement patterns perspective. 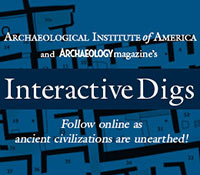 Apart from that, we are also opening excavation pits at two different sites! 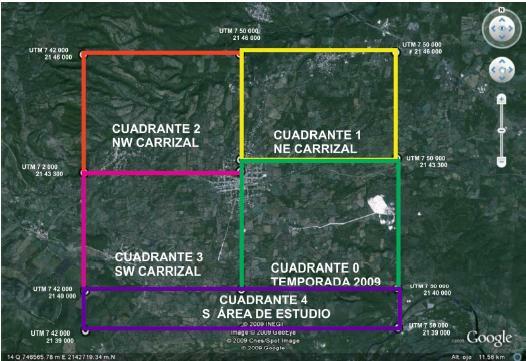 Image (modified from Google Earth) shows how we divided our survey areas, covering 60 sq kilometers around El Carrizal. 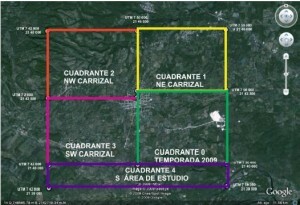 Segment 5 is missing since it is programmed to define it after all the other segments are done, in order to extend the exploration according to our aims. We will continue applying the same method we used last year (GPS mapping and surface material collections), with a very light variants. Instead of collecting 100% of the mounds (our unit), we will only recover materials from 30% of them; so that field and lab schedules don’t take forever! New season started. Students from Universidad Autónoma de Zacatecas following a local guide and their team leader. On the other hand, we are very excited with the new excavations. 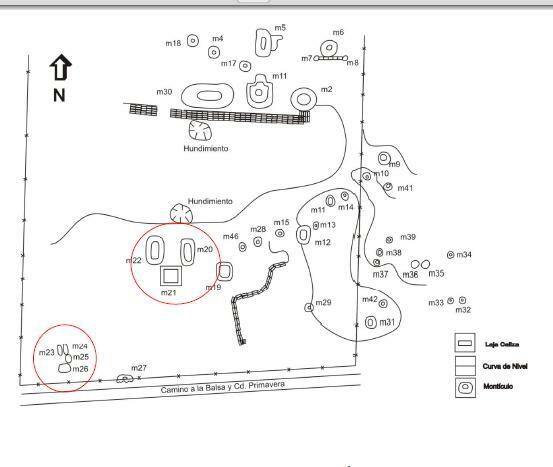 We decided to intervene mound 1053, apparently a domestic unit, as well as the Carrizalito site, which presents formal architectural arrangements. 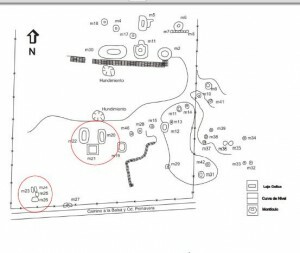 El Carrizalito site map, showing excavation areas in red. Fortunately, AIA granted us the opportunity to video tape the excavations from the beginning, so be prepared to enjoy our field experience through their YouTube site soon! This entry was posted on Monday, August 2, 2010 at 4:16 pm	and is filed under English. You can follow any responses to this entry through the RSS 2.0 feed. Both comments and pings are currently closed. Did you suffer a lot from dammages done by the torrential rains caused by Hurricane Karl and TS Mathew? torrential rains caused by Hurricane Karl and TS Mathew?